Love is missing someone when you are apart, but somehow feeling warm inside you are close in heart. So make someone day more special with the amazing cake surprise Get 1 kg of beautiful snow white heart shaped fondant cake beautifully decorated with edible red roses. 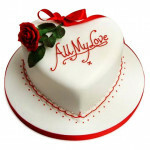 This beautiful fondant cake is available in Chocolate, Butterscotch, Pineapple, Vanilla and Pineapple.